Pavlova, New Zealand's Iconic, National Dessert. 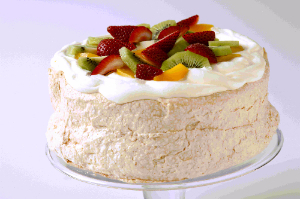 Today, Cowell's Genuine Pavlova is still the leading brand with many exciting enhancements to the classic dessert. Cowell's offers a variety of sizes and flavours to suit your requirements backed by our quality guarantee. If on delivery, you are not satisfied with our products, we will replace them free of charge. The traditional flavour is vanilla, however other flavours are available on request. If you're stuck on how to decorate your pavlova, there are serving suggestions that other people have left for you to try out and enjoy. The following range is available from New World, Pak N Save, Foodtown, Countdown, Woolworths and selected Four Squares. Ingredients: Pure Cane Sugar, FRESH EGG WHITE, White Vinegar (Gluten Free), Vanilla Essence, Emulsifier (339).